The Hare-hatch was one of the old gates into Windsor Forest, presumably where hares were often seen. This part of the forest was an area sacred to the Saxon people and called the 'Frith' (Maidenhead Thicket is the only remaining woodland portion remaining). The hamlet emerged on the edge of this forestland, apparently as summer pasture for local livestock, as indicated by the names of Deane Farm and the Deane fields. Though farming always remained the main industry in Hare Hatch, the building of the Bath Road through the hamlet gave it a great boost as a stopping off place for travellers to and and from London. Hare Hatch hospitality was largely centred around the Horse & Groom, an ancient coaching inn, still popular with motorists today. The area was particularly well known for being frequented by Highwaymen. 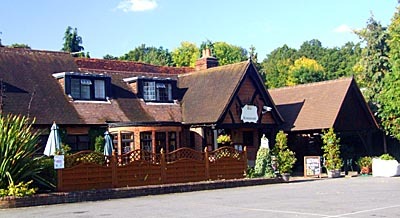 The area is the main centre of the Bear place-names in Berkshire: Bear Grove, Bear Place, Bear Hill, Bear Ash and Bear Corner (there are outliers at Bere Court (Pangbourne), Bearwood (Hurst) and Billingbear (Binfield)). This is usually said to be where Saxon settlers kept pigs in the fields they had carved out of the surrounding woodland. The soil was too heavy for cultivation. A Bare was a “Swine Pasture”. However, at Bear Corner stands Hill Farm which was the home of the A’Bear family, from at least 1553 until 1895. Thus the real derivation of the Corner’s name is explained. Could this family have given their name to the other places too, or was it the other way round? A’Bear stems from Saxon Atte Bear, the prefix meaning “near” or “by”, and the family have certainly been around for a long time. They are recorded in the parish as early as 1318. Around the same time, however, they were also known by the Norman name of De La Bere and family tradition traces their pedigree back to one Richard De la Bere who came over with the Conqueror. Bear Place, where there is a fine medieval moat, may have been the original home of the A'Bears. The present house was built further east in 1784 by David Ximenes. His son, Sir Morris Ximenes, raised at his own expense and commanded the Wargrave Rangers during the Peninsular War. The family are said to have been cursed by a Cathloic priest who found that this ancient Spanish family had abandoned the old religion. There are many other country houses in the area, the most interesting of which is perhaps 'Scarletts'. It was built about 1765, by James Leigh-Perrot, the maternal uncle the authoress, Jane Austen. He lived there very happily with his wife, Jane, for many years. Having no children, his heir presumptive, James Austen, visited him their several times. It is not recorded whether his more famous sister, Jane, ever accompanied him, but she did visit her uncle and aunt at their house in Bath. Poor Mrs. Leigh-Perrot spent some time in prison in that unfortunate city, as well as in Ilchester, when she was falsely accused of shop-lifting.